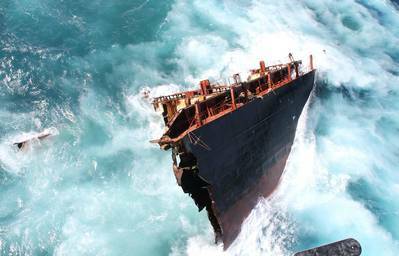 Earlier this week rough weather damaged the bow of the container ship stranded in New Zealand waters off Tauranga. High wind and rough seas early this week resulted in approximately 25m of the fore section, weighing around 250 tonnes, being ripped free from the aft portside and falling to the sea bed. This section included the boat landing platform and access ladder, with gas cutting equipment also going overboard. No salvors were onboard at the time and the loss of equipment has not delayed salvage efforts.